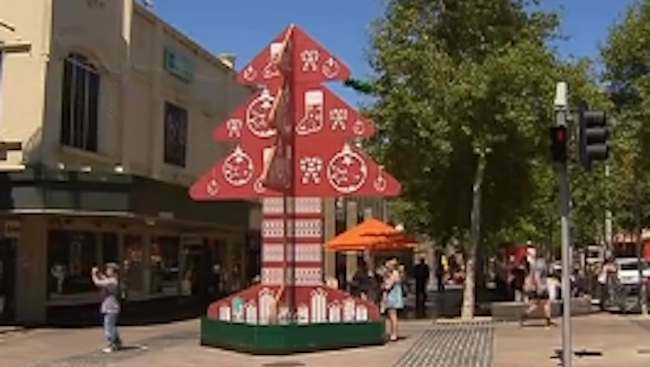 IS this the world’s worst civic Christmas tree? You can see the wonder in Geelong, Australia. That’s some claim. But Australians love to talk big. In a country that can have few natural landmarks, town planners have erected such local interest point as the Duranbah’s Big Avocado, North Arm Cove’s Big Ayers Rock (yep, really), Moonbi’s Big Chook, Robertson’s Big Potato, no fewer than six Big Apples (Spreyton, Bacchus Marsh, Donnybrook, Thulimbah, Acacia Ridge and Batlow), the Big Koala in Cowes and the Giant Koala in Dadswells Bridge, and my favourite, Ballina’s Big Prawn. So. Is it really the world worst Christmas Tree. Or is just a plan to put Geelong on the map and kickstart a new trend Down Under: the world’s worst?